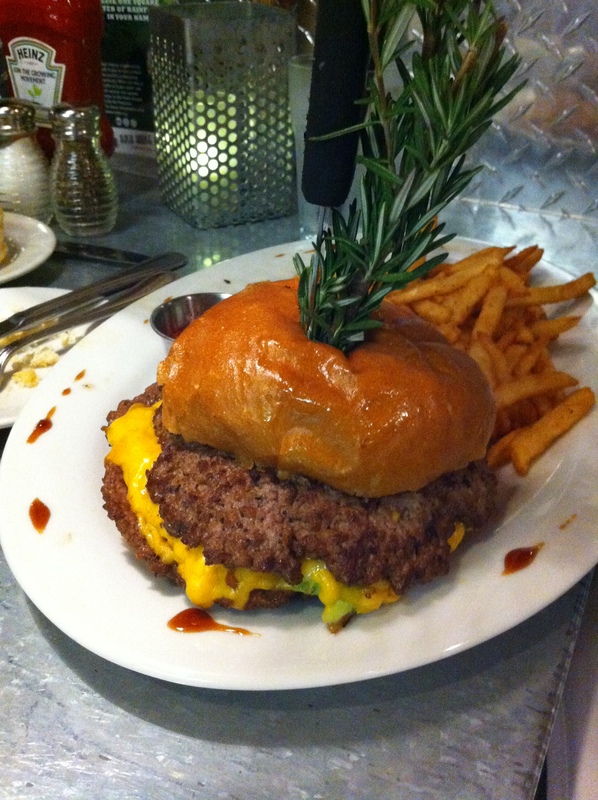 I happened to be going to the Imperial Palace to see a show the other night and before hand we decided that we should get some dinner at the Hash House. I have been to their other locations in the valley so I knew what I was in for. The reason I say know what I was in for is because they serve giant plates of food. You will see what I mean below in the photos. I am going to dive into the food and then after talk about the restaurant itself. 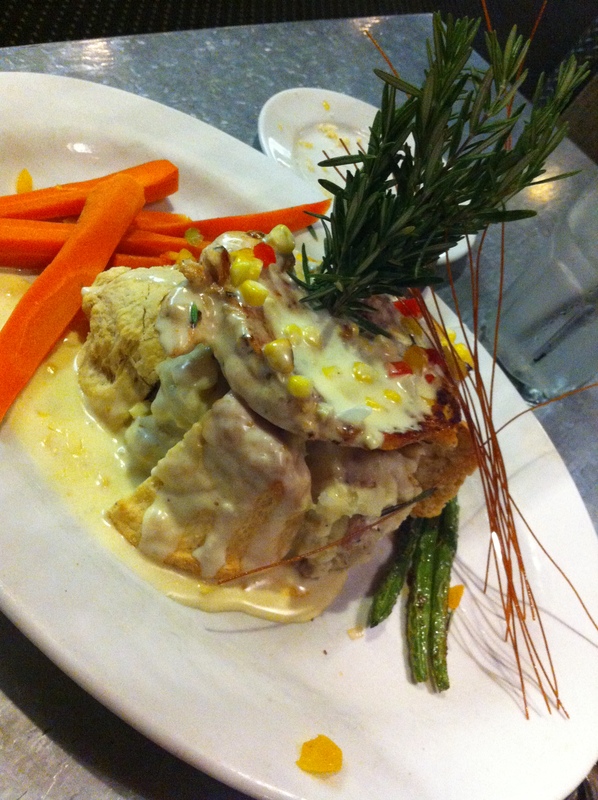 First up was the chicken and biscuits; it is seared chicken breasts on top of biscuits & mashed potatoes all topped with a veggie cream. Now on the menu description it says chicken breasts, which to me means a plural; so I thought there would be two on my plate, but it only came with one. Now in reality one is plenty as you can see because it is a mountain of food as is, but if you are going to describe two there should be two. Now the chicken was cooked well and had a mild flavor, the mashed potatoes that it sat upon were kinda dry and could have used some seasonings because to me it was a bit bland. The biscuits were either a bit over baked or they have been sitting out because the crust was a bit hard and stale and on top of all of this the veggie cream sauce that was poured on top was cold. So this was weird when you have warm potatoes, chicken & biscuits then cold sauce it was very unappealing. So I would definitely skip eating this dish. This is one of their stuffed burgers it is cheddar cheese, bacon & avocado stuffed in between two beef patties. Well as you can see it certainly is a sight to be seen. The burger is too big for the bun as you can tell, my friend had to eat the burger off the sides before she could really begin actually eating dinner. While it is a lot of burger that’s really all it was, a lot of beef, she said that the stuffing ingredients were lost inside with everything that was going on beef wise. She mentioned that it was a little undercooked and not seasoned as well as it could’ve been. Overall I feel like they are trying too hard to maintain this image of having super huge food that they are cutting corners when it comes to quality. Just because they have been featured on a couple TV shows and they know that this alone is why most people will go out of their way to go here. Maybe they feel like they can slack on the details, but this is no way to gain followers and return guests, by letting things like cold and bland food hit the tables. I will be honest and say that I am making this statement based off my last encounter with this restaurant in the M Resort as well as this experience above; because I had a similar experience during this trip as the one before at the M, bland & cold food. While I understand that some quality can be lost when you have a busy service, but this was not the case for my trip that night, there was plenty of empty tables in the whole restaurant and plenty of people running around and even gathered together chit chatting. Our waitress seemed very uninterested in us, I asked for lemons for my water and never got them, it just seemed like she had some place better to be the entire evening. I think the only time she seemed halfway interested in us was when she dropped the bill at our table. So honestly I would say this is a place to skip if you are looking for the details, but if you have friends or family in town and they really want to try this place because they saw it on the Food Network or the Travel Channel then I would say OK but go to the one on Sahara, I had a better experience there than the other two locations. Just be aware that you could get cold and bland food.